The Cause: All proceeds go towards helping the Kelleys adopt their second little boy from Ethiopia! Oh my… where do I begin with Laura and Pitter Patter art?? She pretty much creates anything and everything. Let’s start with the custom art work. Using mixed media techniques Laura creates custom artwork including scriptures, childrens names, names of Jesus and much more. 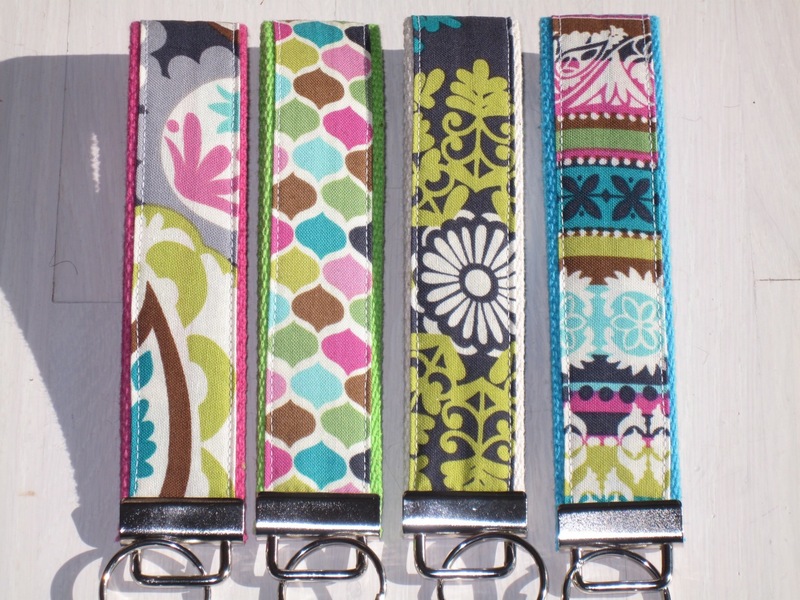 Pitter Patter also takes custom orders for Key fobs and applique shirts. Every shirt is unique in that the customer is able to specify their design AND their fabric choices (which seem to be endless). Adoption tees are available for $20 shipped. The design is based off of one of Laura’s beautiful mixed media pieces. In addition, all donations made on their site (for their adoption) are thanked with a beautiful little Africa bracelet. OKAY! So are you ready for the giveaway! In keeping with Pitter Patter tradition Laura has gone above and beyond in what she has offered me for this giveaway. (Thanks Laura!) Up for grabs are the following items: a set of FOUR key fobs and one Adoption T-shirt (winner picks the size S, M, L, XL). Need a little more incentive? Here are pictures of the giveaways! I REALLY WANT TO WIN THESE 🙂 GREAT GIVEAWAY. SEE YOU IN A FEW! I love these key fobs and know just the perfect person for that tee shirt!!!!! Posted a note on FB for you! Love her stuff – follow her on facebook and always love her stuff! Love this stuff! Love how the adoption response has rippled through our community as God calls His people. OOO I wanna win!! What a great giveaway! What a great giveaway! Woohoo! Love the key jobs!! So much fun! I love this stuff! I love all of her stuff! I will be praying for you and your family as you go through the adoption process. God bless!!! What a great giveaway! And what amazing hearts you guys have. I’ll tweet this and share it on facebook. I love Pitter Patter Art. I can’t wait to “meet” the new boy! Love all of her work! Love the tee shirt and key fobs…but love Laura more!! She is my niece…such a talented young lady!! You have a beautiful family and I look forward to watching it grow through the miracle of adoption! What a wonderful set of posts you are doing! I love it! I shared about you on FB too! Thank you and I look forward to seeing what the other days of Christmas are! I just shared it on facebook…good luck!! I love the new key fobs! Great for stocking stuffers and maybe one for myself 🙂 Laura has made so many cute things for my little girl and for me to give as gifts. These are awesome. They would make great gifts. I’d really love to win one of your fabulous key fobs, and the t-shirt. Those nifty key fobs all have places to go on my Christmas list, but I would surely love to put that adoption tee shirt in my closet! I love the shirt! And the key fobs are adorable! I would love to win these items! I love Pitter Patter Art! Thanks! I also shared on facebook!! Really cute! These would be awesome Christmas presents! I’m sharing on facebook and Twitter! I love these!! What an amazing gift she has for all her creative crafts. I hope I win one 🙂 I am going to share on facebook as well. WOW, what an amazing gift she has. Can’t wait to hear if I have won one 🙂 I will share on facebook too. Love Laura’s stuff! Would love to win! i ♥ pitter patter art!!! Love pitter patter art. I have told many friends about the great stuff there. I love these key fobs! I love all her stuff! Posted on facebook as well. I love your unique work and ways that you are incorporating your love for adoption in what you do…God has truly given you this gift to share with others! Love me some Pitter Patter Art!!!!! Love pitter patter art and the wonderful way to raise money for adoption expenses! Hoping for a winning entry. I’m commenting on this post to be entered in the drawing. I will be commenting on facebook and twitter as well as soon as I hit the Post Comment button. Here’s my comment saying I am posting on FB! I love pitter patter! i use my keyfob every day at school! I love the significance and uniqueness of each piece. Truly an inspiring gift, I love pitter patter art! Thanks for entering me. I will also tweet! I would love to win these! I LOVE Laura’s stuff! I would love to win! Her stuff is so cute :). Love Laura & her sweet family! She’s a bit crazy but she can’t help that. Pitter Patter art is my FAVORITE!!!! Great giveaway! Love Laura’s stuff! and even better to win and pass on in the spirit of Christmas. Pitter Patter Art is so inspiring. I would love to win! I will also post on Facebook! I’ve also had the privilege of working with Pitter Patter. Her stuff is GREAT. I am linking to facebook! would LOVE to win, I was to late in getting a order in. I would love to win. I just got my first car and I would LOVE LOVE some key fobs for my new keys!! I love her Key Fobs! They are the best! I L-O-V-E these… I LOVE Pitter Patter too… This is a rad giveaways! Hope you pick me, pick me, pick me! Woohoo. Love these.. my daughter has an adoption shirt. Iti is so beautiful! I will share on facebook too. We love Laura too. She has done some great stuff for us and helped with our adoption. Hope to win this wonderful shirt and love the key fobs. Great for christmas! I love these key fobs! Pick me! erica! so fun. what fun adopting friends you have made during this process. so proud of you guys! so cute!! Love this! Sharing on FB and Twitter for ya! I LOVE Pitter Patter Art!! Would love to have these for teacher’s Christmas gifts!! I LOVE everything she makes!!! Would love to be entered to win!! Very very pretty things. Thanks for the opportunity. Would love these key fobs! I was too late to order some in time for Christmas! Just facebooked about it with a link! Too bad I don’t twitter. So cute!! Love it and what you are doing…will post on fb as well!! Here’s my comment for entry #2! I shared on Facebook! Oh…I forgot to tell you that I shared this information on FB! Been following Pitter Patter Art for a while now. Love her creations. I’ve always wanted to win one of her key fobs!